These chaps are the last of the basic units for the Sub-Roman / British Dux Brit army. Two sets of six warriors, armed with spear and shield, and distinguished from the rabble of levy troops by their helmets and the (relatively) uniform white-ish tunics. These are the main strength of the Sub-Roman army, professional troops, under arms at all times, provided with centrally-supplied weapons, and with some degree of training. 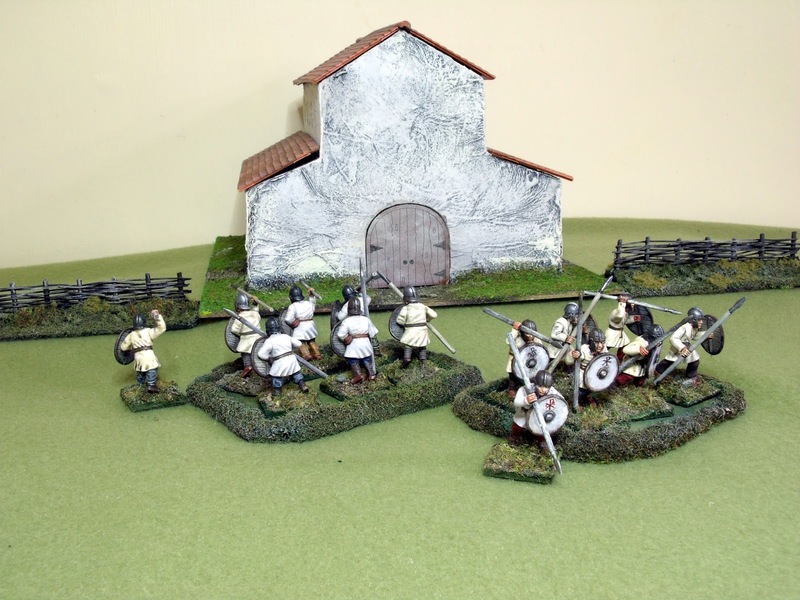 Able to fight in shieldwall, these troops have a good deal of stopping power and it would be a mistake to underestimate them. To no-one's great surprise I'm sure (and why change a winning formula? ), these are Gripping Beast Dark Age Warriors, with West Wind heads. 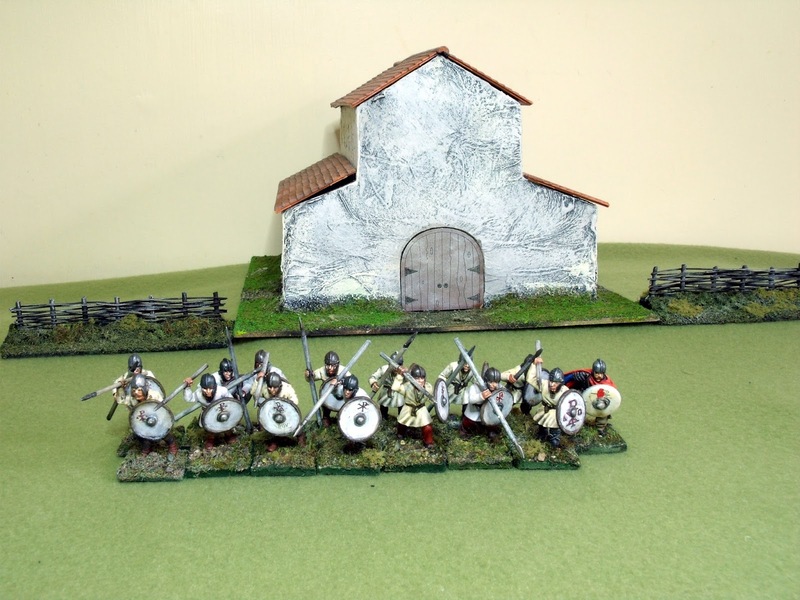 This has given me a nice range of poses, with enough variation to make the men look like they are a Dark Age warband, not a nineteenth century army. All round defence - cunningly showing the backs of the minis! I toyed with the idea of modelling spare hand weapons on these - swords or axes would have been appropriate according to my sources - but decided I would rather have the men on the table. I gave the shields a fairly good coat of white paint, although the slight unevenness and occassional brush mark serve to suggest whitewash applied with a fairly coarse brush. The shield decals are home-made, from a batch I prepared for the elite troops. A gentle drybrush helped to blend the decal with the background. 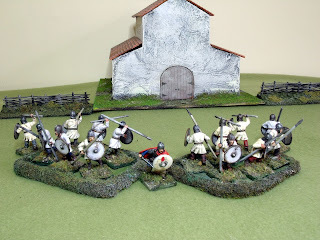 Drawn up in shield wall to defend the church - a tough nut to crack! The more observant reader might notice there are actually fourteen minis here, rather than twelve. The pack provides enough figures to make eighteen levy, twelve warriors, four missile troops - and six spares. 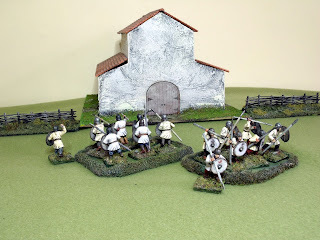 Two of the six are here, and represent the first pair of invidual reinforcements (as opposed separate reinforcement groups) as described in the Dux Brit raid or battle victory tables. So should I fancy a campaign (and be successful!) I'm getting ahead of the game. These look great. I like the shields. Very nice unit love the white tunics. 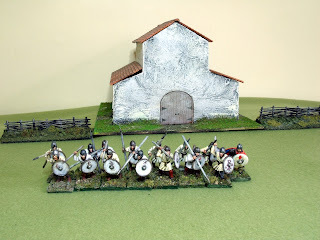 Very nice looking troops, and great shields!